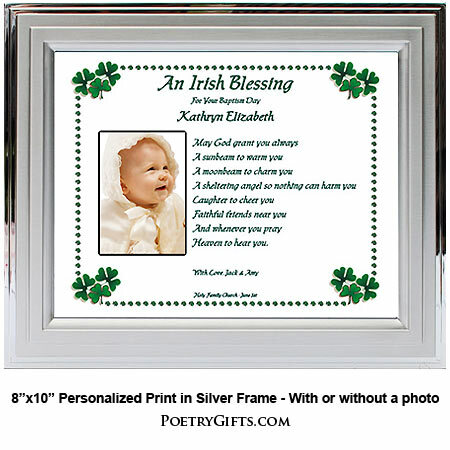 This Irish Christening gift has an Irish blessing personalized for a baptism or christening. Whether you are the child's parents, Godparents, or Grandparents, this beautiful Poetry Gift is a wonderful keepsake that will be treasured always. 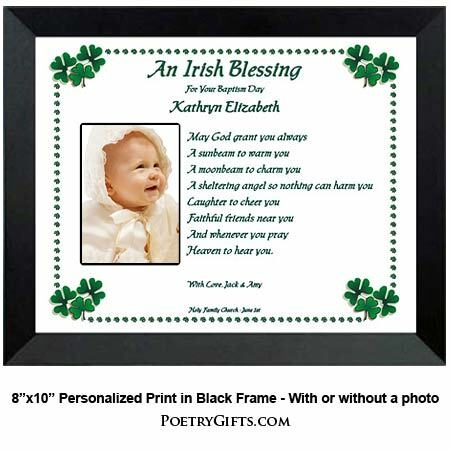 This beautiful Irish Blessing is the perfect sentiment for a child's baptism. Personalize with name, Godparent names and baptism date. Recent baptism? Not too late to give this as a special personalized baptism gift that will become a treasured keepsake, especially after a photo of the baby has been added. The shamrock design is perfect! Your Poetry Gift can be designed with or without a cut-out opening for a photo next to the poem. A second sheet underneath the poem and photo cut-out is a heavy stock paper with the words "Place Photo Here." There is no need to send us a photo. 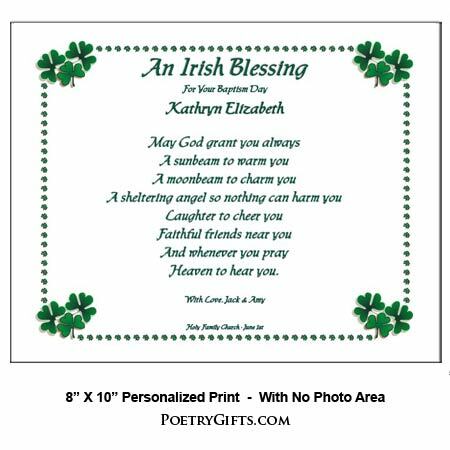 You or the gift recipient can easily add a photo after the Poetry Gift is delivered. The photo is positioned in back of the opening and then taped on the paper. You have the option of attaching a photo before you give the person the gift or the person receiving the gift can easily insert the photo. 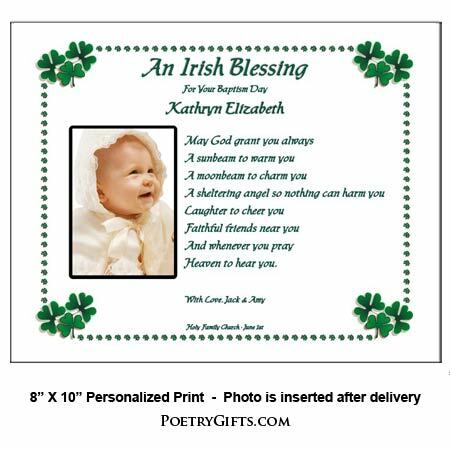 This beautiful Irish Blessing is the perfect sentiment for a child's baptism. Personalize with name, Godparent names and baptism date. ($19.95 is the unframed price) Recent baptism? Not too late to give this as a special personalized baptism gift that will become a treasured keepsake, especially after a photo of the baby has been added. The shamrock design is perfect! Answer questions above and then "Add to Cart"
I ordered this in the silver frame for my granddaughters baptism and it was absolutely beautiful and made quite the impression at the reception. Everyone just loved it. I ordered it 2 weeks in advance of the event but paid for express shipping since I have had issues with other web stores and not receiving gifts on time. I was thrilled to have it arrive within 3 days of the order. Thank you. The frame is a high quality product and beautiful and the service is excellent. Love your web store and will definitely be shopping here again. Thanks again. I've gotten this as a Baptism gift for both my niece and nephew now (both are my godchildren) and I think they've been perfect- tasteful, unusual, and personal. My sister was really excited to receive the second one last week. I was also very happy with how quickly it came in the mail. I have to say, this was the nicest gift at the party. Would order again. The silver frame for my son's baptism came today and it is beautiful! Thank you! Thank You Gift for Parents - Personalized from you!